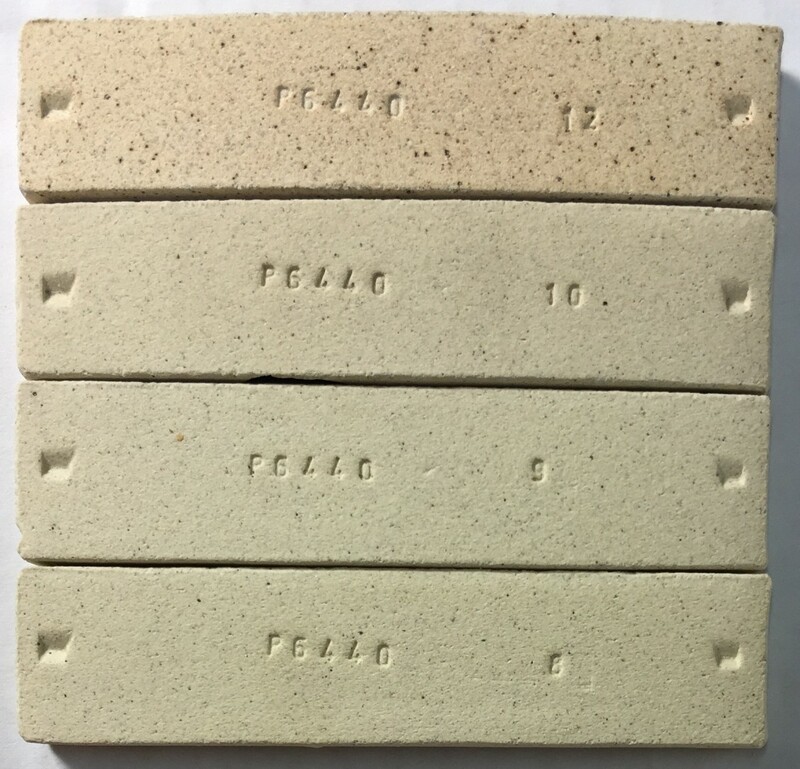 A refractory light colored lightly iron speckled plastic clay blend originally formulated to mimic the working and fired properties of Standard AP Green Fireclay. Because Plainsman Fireclay (PFC) is a blend of refractory materials (a ball clay, a stoneware, a kaolinized sand and a kaolin) it is more consistent than pure materials that are just mined and powdered. While we serve mainly the ceramics and pottery markets, we stock dozens of products related to refractories (e.g. ceramic fiber, castable refractory, refractory powders, thermocouples, firebrick, refractory cement, elements, burners, kilns). You can search these on the home page of this website. For pottery and ceramics, users will note that Plainsman Fireclay has a wide distribution of particle sizes (from 42 mesh and finer). However it still feels relatively smooth in the plastic state. If your body is less plastic using Plainsman Fireclay (rather than what you have used in the past) add a little bentonite to the recipe (1-3% to start). If it is more plastic exchange some ball clay for kaolin in the recipe or select less plastic substitutes for other clay ingredients. Because this material contains 10% of a very fine white kaolinized sand water-splitting in the plastic state can be an issue (the sand provides a channel for water penetration into the plastic clay. If you experience this (e.g. vertical cracks during throwing) then either exercise more care to avoid leaving water on surfaces that are being stretched (e.g. bellies on vases) or add some bentonite to the recipe. Plainsman Fireclay may have a higher drying shrinkage than other fireclays so a little more care may be needed to dry pieces evenly in plastic bodies with substantial amounts of fireclay. For general refractories applications it is common to mix this with sand. Silica sand, or even better, a low thermal expansion aggregate like kyanite or molochite, is needed (ordinary construction sand is not suitable as it contains grains of feldspar and other low melting minerals). This material shrinks on drying so it is important to minimize water content when forming it. Since this is a clay, not a cement, it shrinks on drying (up to 7% for the pure material in the plastic state). Ramming low-water-content material into a mold is better than trying to shape the plastic material (since shrinkage will be far less). Any molding done must be done in such a way that the mold can be removed after forming to allow the fireclay/sand mix to shrink. On first use in your refractory application, be careful to heat the mass up slowly to allow water escape. Even though it appears dry, there is still significant hydrated water in the clay crystal that must escape. Plainsman Fireclay fired bars. Cone 10R top. Cone 8 (2265F) to 10 (2330F). Maturity: Almost all clay bodies employing fireclays will also contain feldspar, add or remove a few percent to compensate if the body is more or less vitreous using this. Speck development: If you use fireclay to impart speckle in reduction bodies, this material could affect the fired appearance significantly. This will not have any large specks (a typical contaminant in many fireclays), rather, it will likely show a higher population of finer ones. Dunting and thermal expansion: This may be higher in quartz, therefore consider removing some silica from the recipe if dunting becomes a problem. However, the upside of the higher quartz is that glazes are less likely to craze. Soluble Salts: This material may dry with some iron-bearing soluble salts left on the surface. These tend to impart a brownish coloration to some areas where they concentrate (the fired character of traditional fireclays, especially in reduction, is partly a product of this). These deposit differently depending on the potter's process and natural variations in the raw material. For refractories applications: This is not a super-duty fireclay. However it will easily remain stable to 2400F and even higher. The vast majority of refractory applications work below this temperature. This material can be mixed with other materials to increase its heat duty (e.g. molochite, quartz, calcined alumina, kyanite) if needed. A typical forge, heated by a gas flame, is not capable of reaching to limits of this material. PFC is not air floated, it contains particles you can feel. These generate gases as the kiln is fired and can cause pinholes or blisters. For example, there are particles of calcium sulfate, these generate sulfur during firing. Rutile glazes, for example, are well known for the blistering problem. If your glazes are affected you may need to do a drop-and-soak firing. Do this by firing to temperature (e.g. cone 10), soaking long enough to even out the kiln, then drop 100 degrees and soak there (glazes stay fluid at much lower temperatures than most people realize). This enables the increasing melt viscosity of the glaze melt to overcome the surface tension that may hold bubbles in place. They will break and the glaze will heal. Vs. Plainsman Buff Fireclay: This differs from the discontinued Plainsman Buff Fireclay in that it is a little smoother (having less sand), not quite as plastic and not quite as refractory. This material is actually Buff Fireclay with some ball clay and sand replaced with a smooth stoneware clay. Left: 25% Plainsman Fireclay with 25% nepheline syenite. Right: 35% nepheline. 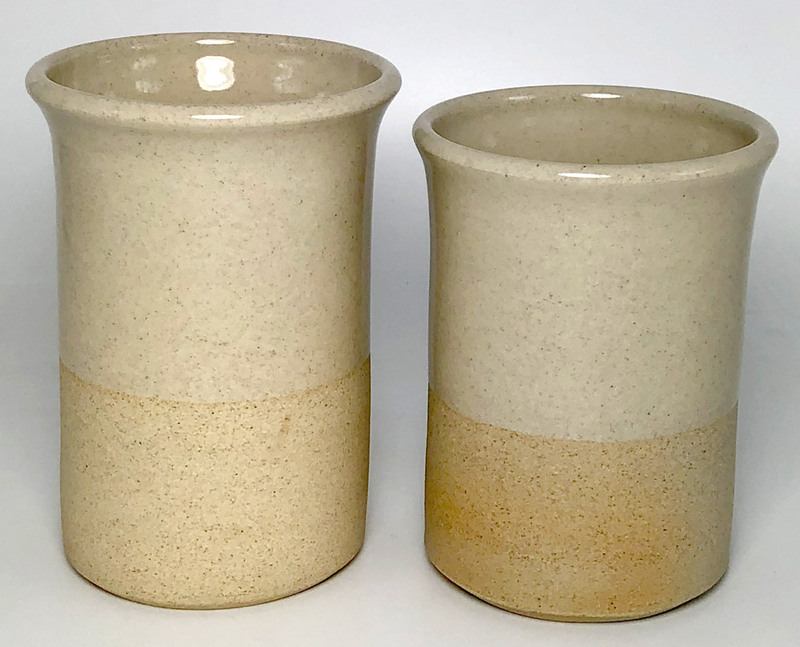 Both produce a stoneware, but the right one is more vitreous (0.8% porosity vs. 2.1%). However the left one has good plasticity whereas the right one is only fair. Because the fireclay has plenty of quartz glazes do not craze. The pinhole-free glaze surface was achieved using the C6DHSC firing schedule. Notice the one on the right has some flashing on the bare clay surface, this is from the soluble salts that migrate to the there during drying.